We are excited to help you plan your vacation! We have 6 Innsbrook properties on vrbo so you've come to the right place! Recently redecorated with bathroom upgrades and a new sand beach! PLUS a new lakeside fire pit & patio, perfect for enjoying the outdoors year-round. If your idea of roughing it includes a premium property with satellite TV, WiFi, a gorgeous lake setting, complete privacy and endless amenities, you've found the perfect location! Enjoy a long weekend or an entire week in a beautiful newer Innsbrook A-frame. Located within a gated community, this chalet was built in late 2007 and is luxuriously outfitted for all of your getaway needs -- whether you're seeking a romantic escape or a weekend of fun with family and friends. Nestled within a 1.3 acre forest of trees, this very private deluxe chalet is the perfect setting for your next vacation. Lake Sonnenblick is just outside the door where you will enjoy watching a constant flow of wildlife. Sit on the dock or the deck, or even the screened in porch and feel a part of nature in Innsbrook's Audubon Sanctuary. Take a paddleboat ride around 4-acre Lake Sonnenblick. In the summertime, enjoy the popular sand beaches and swim docks on 150-acre Lake Aspen, the Conference Center and beautiful outdoor swimming pool, as well as Innsbrook's award-winning 18-hole golf course and Hanneken's Restaurant, all just minutes from the chalet. Three private bedrooms are fully furnished with queen-size beds. The loft also contains a sleeper sofa (queen size) and twin size rollaway. A crib is also available! The beautiful first-floor living room has amazing views and a wood-burning fireplace, perfect for Fall and Winter getaways. The over-sized kitchen is well-appointed and is ready for preparing meals for small or large gatherings. A gas grill on the deck is also available. Satellite TV with upgraded movie and sports channels is available at no additional charge. At Innsbrook Resort, relax and enjoy the outdoors -- you are surrounded by towering trees and the beauty of nature. The 8000 acres of the Village of Innsbrook includes 100 lakes and is a certified Audubon Sanctuary, the first resort to be so designated in the United States. Innsbrook is a community committed to protecting the natural environment -- take pleasure in long walks and nature trails, enjoy horseback riding, swimming and miles of biking. Innsbrook also offers many additional family activities, including concerts, a music festival, art and garden shows, camps for kids and outdoor movies. Most events are free or available for nominal cost. A paddleboat is included with the chalet and is stored at the water's edge next to the dock. Please send us an inquiry to check for dates as we don't use the online calendar. 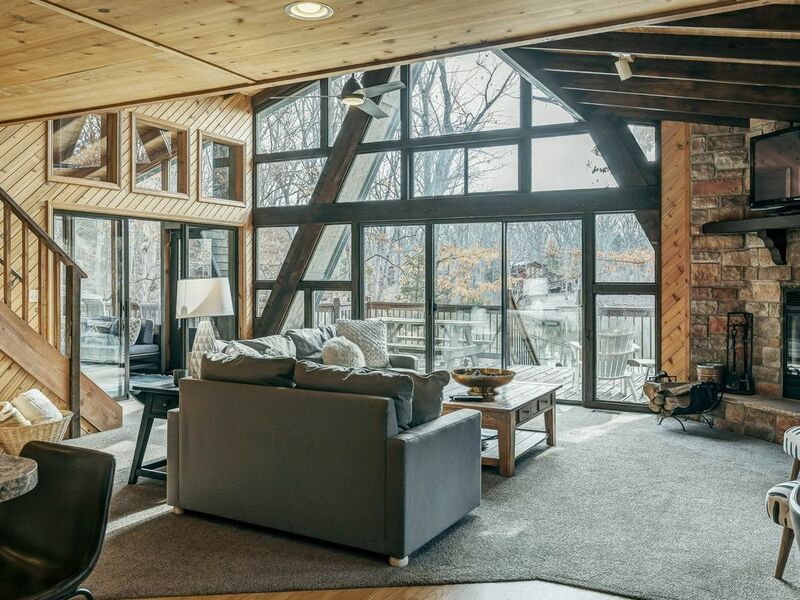 We have six properties at Innsbrook and will be happy to help you find the perfect chalet! I live in St. Louis County with my three children and love that we can easily get to our Innsbrook house in an hour, door-to-door, for a getaway weekend or sometimes for just a night. We purchased our first property at Innsbrook in 2005 and moved in for summer fun in 2006. We love going to Innsbrook as much as we can! We spend our days swimming in the lake, feeding the huge catfish that come to our dock, picking lots of berries, grilling steaks and exploring the woods. We absolutely love our time at Innsbrook and are anxious for everyone to experience how wonderful it is. No one has yet to come away less than enthusiastic! Innsbrook is a world away from the busy suburban life that we live most of the time. When you pass through the main gate at Innsbrook, you feel like you've traveled across the country to a unique destination. It's a peaceful getaway, full of family fun, yet such an incredibly easy escape. We bought this chalet in 2008 to use as a vacation rental so we can share everything we love about Innsbrook with others -- old friends and new friends alike. We love to bike the many roads (& hills!) of Innsbrook on early summer mornings. The kids love to fish off the dock all year and they spend hours in the summertime in the water -- swimming, floating, sailing. (They've even been known to break through the ice in the wintertime in the kayak). The wildlife is incredible -- not a day goes by when we don't see deer, bluebirds, woodpeckers, owls. It's a huge treat to see the animals to close to us. We also love the simple life that Innsbrook offers -- the orchards nearby, tiny Harmony Church, the friendliness of all the staff, the country store for ice cream, the farmer's market for homemade bread and fresh produce. We have explored it all -- golf, tennis, the basketball courts, all the beaches, the running trails, the outdoor movies. We love sitting on the deck with a cup of coffee or glass of wine just taking it all in; total relaxation. Main level full bath has a shower with full laundry facilities; Second floor bath has a shower/tub combo Shampoo, conditioner, body wash and hair dryer provided! Incredible view of 4-acre Lake Sonnenblick; chalet sits just 50 feet from the water's edge. The deck connects via stairs to the dock on the water. Indoor & outdoor fireplaces; wood and fire starters included. The kitchen is completely outfitted -- cookware, dishes, glassware, silverware. Paper towels, coffee, tea, creamer, sugar and basic spices are all provided. Lots of books and feel free to take or leave novels! Outdoor furniture including lounge chairs & picnic table provided. A 3-person paddleboat is available at the chalet at no additional charge, along with two kayaks. Great fishing off our dock! Bring your gear. New Sand Beach and firepit! Sarah was very responsive to all my questions. The chalet was lovely and peaceful. Modern appliances and a nice wood burning stove and fire pit. We very much enjoyed our stay! Saba was a wonderful guest! She is welcome back anytime. We love that this chalet is pet friendly. And we really loved the lakeside dock and beach area - great set up for kids! We loved having you stay at our chalet and are so happy you enjoyed the dock and beach! Hope you can come back soon! If you want a a great cabin in the woods an hour away from St. Louis Innsbrook is your place! This chalet offered us a quiet retreat that fit the whole family for a weekend birthday celebration. We used all of the amenities- the fire pit, the paddle boat, the kayaks and the little ones had fun splashing in the lake, playing in the sand and fishing! The cabin was clean and the owner made it easy to book, find and relax! Thanks Emily! We are so happy you and your family were able to enjoy a birthday celebration at the Lakeside chalet and able to have fun with all the amenities. We look forward to your return! Wonderful setting for musicians. The band played Saturday afternoon on the dock. So peaceful. We have enjoyed #1717 every 6 months since 2009. The fire pit is a plus. No negatives at all. Sarah is the best. Can't wait to come back. Aww, you guys are the best! We love your music at Innsbrook and I am so incredibly honored to host you all twice a year. Can't wait for your next visit! Beautiful location, house is awesome with everything you need at your fingertips. Enjoyed the lake, yoga classes, hiking. Will return as soon as possible! we stayed here for our sons wedding and it was a great place for the family to be together. Great place to golf and have fun. Very peaceful setting. Pick-your-own orchards, pumpkin farms and Christmas tree farms are nearby. Enjoy the small town charm of nearby Washington and Marthasville and the many wineries of Augusta and Hermann. Visit the Daniel Boone Home and the Katy Trail, both within a 30 minute drive. At Innsbrook, enjoy an array of activities, including Camp Innsbrook for the kids, outdoor movies and concerts, hayrides, horseback riding, nature trails and numerous public beaches.